It’s been an exciting week for local non-profit, Children’s Environmental Literacy Foundation (CELF). First CELF was selected as a 2017 U.S. EPA Environmental Champion for its innovative work bringing sustainability education into K-12 classrooms. The award ceremony will take place on May 19th at the EPA’s offices in Lower Manhattan. CELF was also awarded a New York State Pollution Prevention Institute (NYS P2I) Community Grant this week. CELF focuses on strengthening teaching skills and administrative practices that support and enhance STEM and citizenship skills, helping teach students to recognize and make decisions based on their understanding of the interconnections between a healthy environment, a vibrant economy and socially-just communities. With guidance from CELF, educators learn to identify opportunities for authentic learning and student projects—like students in Hastings who designed an app to redirect unsold restaurant food to the homeless; Scarsdale students who are testing the health of a nearby stream in their biology class, and Los Angeles middle school students studying the impact of the LA port on air and water quality in their school community and creating action plans to mitigate these impacts. The Environmental Champion Award is the highest recognition presented to the public by EPA Region 2. It recognizes those who have demonstrated an outstanding commitment to protecting and enhancing environmental quality and public health. The New York State Pollution Prevention Institute (NYS P2I) Community Grant Award Project will allow CELF to engage NYC public school students as environmental health researchers to collect and analyze air pollution data from their neighborhoods. Students will identify sources of air pollution and develop prevention and remediation plans for their communities. The NYS P2I project partners will include Mount Sinai Pediatric Environmental Health Specialty Unit, CUNY Law School Center for Urban Environmental Reform and the NYC DoE Sustainability Initiative. 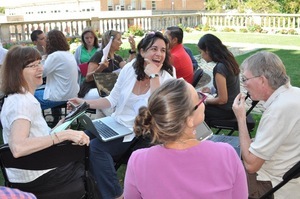 CELF hosts its flagship Summer Institute in Education for Sustainability each July at Manhattanville College in Purchase, NY, and undertakes long-term engagements with schools like Putnam Valley Central School District in Putnam County and the Hewitt School in New York City. 2016 CELF Summer Institute participants collaborate on curriculum at Manhattanville College. CELF & Mt. 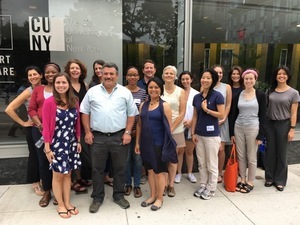 Sinai team with participants and CUNY Law partners in its 2016 “Citizen Science and Social Justice” course.